For customers who demand perfection, Spider Company is the purpose built link between engineering possibilities and precision finished products. Our process is called Intelligent Manufacturing (IM) and is the difference we bring to vital building components. IM is the reason why Spider has remained the industry leader in aerospace deburring, tight tolerance CNC machining, laser cladding, fabrication, powder coating and tube forming. 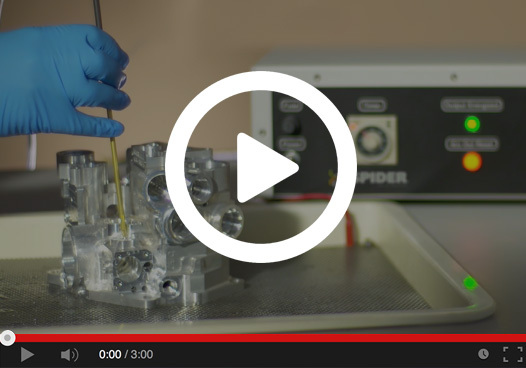 Watch a short video and see how Spider’s ECD deburring technologies target microscopic imperfections without damaging critical components. Spider Company is the industry leader in tight tolerance microscopic and electrochemical deburring. Spider bench deburring services have long been the industry standard. And now our line of ECD products deliver repeatable perfection in complex components by deburring where others dare not go. Spider Company supports manufacturing needs with technological precision. From traditional arc welding, to high tech lasers, to custom metal fabrication. We offer powder coat finishing services in both large batch ovens and conveyorized lines. Flexible solutions, a key component of our approach to building smarter. Spider Company has zero tolerance for compromise. Whatever the material, from standard to exotic, our CNC expertise manufactures parts to exacting expectations. This attention to detail has made Spider the leader in those industries that require guaranteed strength, precision and performance – from prototype to production. In those “can’t be done spaces” beyond the reach of other companies, Spider steps in, adapts and problem solves. Building on our legacy of tube manufacturing, bending and inspection from raw stock to finished product, Spider brings a new expertise to aerospace standards, forming tubing to 1/1000th inch tolerance. Our additive manufacturing process joins two dissimilar materials utilizing a high wattage laser. The joint created has high metallurgical integrity, even between exotic alloys, which guarantees the strongest joints in critical components. Spider LC technology lowers costs and minimizes wear, corrosion and heat. Spider Company specializes in the manufacturing of custom products, up to and including electrical/electronic products. We can manage the full spectrum of product development from start to finish. A partnership that further demonstrates how Spider solves specific customer problems, defining how Spider Intelligent Manufacturing (IM) equates to unlimited customer solutions.